Maine is a state that specializes in lobster and craft beer. We do however have some wonderful local spirits and really talented bartenders who come up with some amazing cocktails. 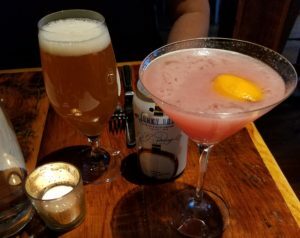 Here’s a list of the some of our favorite drinks to be had in the restaurants in and around the Kennebunk’s. It’s not an exhaustive list by any means…feel free to share your favorites if we missed some! Let’s start with an oldie but goodie. The Cosmopolitan. Hands down the best Cosmo can be had at 50 Local in Kennebunk. This charming French/American Bistro style restaurant is run by Merrilee Paul and her husband David Ross, who is the chef. Their farm to table approach includes foods sourced locally wherever possible. Everything is fresh and the flavors are amazing. But back to the Cosmo! Their version is light with the perfect touch of cranberry and lime without being too sweet. A real homage to the original cocktail. Old Vines Wine Bar in Kennebunk’s Lower Village has an amazing selection of cocktails that they refresh seasonally. You’ll notice all of our favorites are vodka based, which is our personal preference, but their menu includes drinks made from a lot of different spirits. Their interesting cocktails are made with things like “coriander-infused scotch” and “pink grapefruit liqueur”. It’s hard to choose a favorite with such a wonderful selection to choose from but we’re going to go with the Ladybird. This drink is made using grey goose pear vodka, lemon, grapefruit and earl grey cane syrup. A little sweet due to the pear with a subtle hint of the earl grey coming through. Perfect with their signature Chicken Meatballs (or anything else on their menu!). 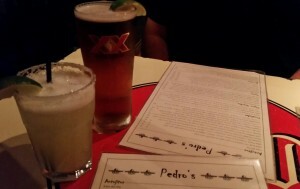 For the best margarita, Pedro’s is without a doubt the only place to go. We like their Clasica Margarita, but you have a choice of flavored options including Grand Grapefruit or Strawberry Hibiscus. This little Mexican cantina is a local’s favorite because it’s casual and fun. Grab a margarita, some chips and guac, or an order of the nachos (Ole! ), and you’ll definitely feel that south of the border vacation vibe here in Maine. No list would be complete without the Sweet Tea Martini at Bandaloop. This farm to table restaurant is one of our favorites and is run by husband and wife team Scott and Bridget Lee. Chef Scott’s ingredients are local and organic sourced and offer a nice selection of seafood, fish, salads, beef, chicken and pork. They do particularly well with vegetarian and gluten-free options for those who have dietary concerns. If you can only have two things when you dine there, we would recommend the muscles and the mac-n-cheese. Bridget created this new Sweet Tea Martini and it’s perfect on a warm evening here in Kennebunkport! It’s simply made with sweet tea, Absolut Citron and a touch of cane syrup. Delicious. Happy dining everyone. We hope you enjoy a cocktail or two when you next visit us and we look forward to hearing about your favorites!